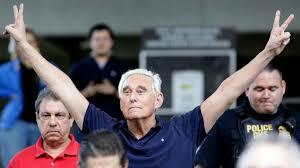 Washington Post columnist Harry Litman has put out one of the most truly bizarre light-bending breakdowns of the Roger Stone arrest and indictment. I'm talking real other world stuff. I know it is very early in the year but I have no qualms giving Litman this year's Stalin Show Trial Award-Columnist Edition. There is nothing, NOTHING, that pairs Stone with Russian hacking activities--if there was any hacking in the first place. There is no, zero, "clear link" between Stone and "the actions of WikiLeaks." Like the aggressive political operative he is, Stone was trying to hustle up information about what WikiLeaks had. It appears that Stone was able to only gain third-hand information via Randy Credico, who in turn was getting information from a female lawyer who was doing work for Assange. It is quite clear that the attorney was not aware that Credico was providing the information to Stone. There were two degrees of separation between Stone and Assange. Further, Assange was getting incoming information, not directing any Assange actions. This is absurd. There is nothing in the indictment that suggests a Stone "role in the hacking conspiracy." And, again, this is assuming there actually was a Russian hack. The writer teaches constitutional law at the University of California at San Diego and practices law at the firm Constantine Cannon. I think the real evidence for conspiracy is on the part of the FBI. There is actual proof that two of the investigators were out to get Trump from their texts. Russians have always meddled in our affairs and we have always meddled in theirs (ie Trump sending arms to Ukraine) but the real concern should be the institutions at home like the FBI. They have always been more of a threat to people of their own country than anyone else. Deaths by the millions has always been done internally, not by foreign adversaries. Will had the right idea.